Select �-� or �+�. You can also adjust the volume using the steering switches or the volume knob. �Release tones� appear when a continuous tone signal(s) containing a (w) is registered in the contact list. when the "p" pause tone is used, the tone data up until the next pause tone will be automatically sent after 2 seconds have elapsed. When the "w" pause tone is used, the tone data up until the next pause tone will be automatically sent after a user operation is performed. Release tones can be used when automated operation of a phone based service such as an answering machine or bank phone service is desired. A phone number with continuous tone signals can be registered in the contact list. Tone data after a "w" pause tone can be operated on voice command during a call. 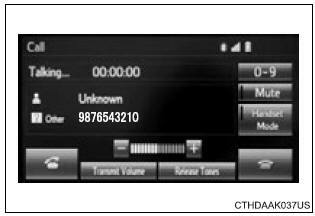 Select �handset mode� to on from a hands-free call to a cellular phone call. 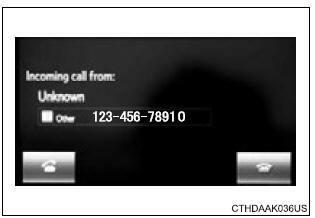 Select �handset mode� to off from a cellular phone call to a hands-free call. switched to the other party. ?If you transfer from the cellular phone to hands-free, the hands-free screen will be displayed, and you can operate the system using the screen. Transfer method and operation may vary according to the cellular phone used. For operation of the cellular phone in use, see the phone's manual.